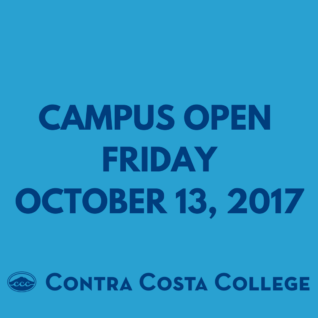 Contra Costa College, as well as our sister colleges, will be open on Friday, October 13th. This decision has not been made lightly. The air quality is not expected to change dramatically over the next few days and possibly well into next week. Although it is predicted to be better than what we experienced recently, this may be what we will face for the foreseeable future. We understand that our K-12 Districts (both WCCUSD and JSUSD) will remain closed, yet we have deemed that since we primarily serve an adult population, it is best to reopen and allow faculty, staff, and students to use their own judgement as to whether or not to come to campus. One basis for the decision is the minimum day requirements for the college calendar, which would call that we add another instructional day to make up for a Friday closure. Another is that the emergency shelter operations is now in place, operating smoothly, and we don’t anticipate significant interruptions or staff resources needed. Please know that the health and safety of our students and employees is our paramount concern, and therefore recognize the decision to participate in classes and services tomorrow can and should be made on an individual basis. Again to our faculty, I ask that you make considerations for students who are unable to attend classes tomorrow – especially our Middle College and Gateway to College students who will not be in attendance. Faculty are encouraged to make alternative arrangements with students as is appropriate. Also note that we have approximately 40 sections that meet this Friday. For faculty and staff, please follow your constituencies’ leave processes should you choose not to come to the college tomorrow due to health or other considerations. October 12, 2017 update – 11:00 a.m. The American Red Cross and The Salvation Army have established an emergency shelter on the Contra Costa College campus. If you’d like to support their efforts, learn more about ways to help. After major consideration and deliberations, we have determined it best to close the college tomorrow – Thursday, October 12, 2017. All classes and activities including athletic events and practices are also cancelled. Classes and all college operations are expected to resume on Friday, October 13th, unless otherwise notified. The decision to close was focused on the health and safety of our students and employees, due to rapidly deteriorating air quality. We have also learned that the West Contra Costa Unified and John Swett Unified School Districts will be closed tomorrow. College employees are not required to report in to campus unless directed otherwise by their supervisor. We will be sending email and text alerts to all students, as well as posting to all college social media and website. The home football game against Santa Rosa Junior College on Saturday, October 14, 2017 has been cancelled. All outdoor athletics events and activities have been cancelled for Tuesday, October 10, 2017. We are aware that the air quality is suffering due to the multiple fires burning in the surrounding areas. We are monitoring the situation and using the data and recommendations of the Bay Area Air Quality Management District. Our area is currently identified as “unhealthy for sensitive groups”, but no recommendation for closure is made for our cities. If students are experiencing sensitivity due to asthma and other health-related conditions, please allow flexibility regarding attendance. If you are experiencing sensitivity, please utilize the leave process in place for your constituency group.